Music Care: Can Wealth Really Help? This simple chart illustrates the impact of wealth creation through free enterprise. About 35% of the world's population lives in China and India, and both countries' economic reforms in the last twenty-five years have had a dramatic effect on wealth distribution. 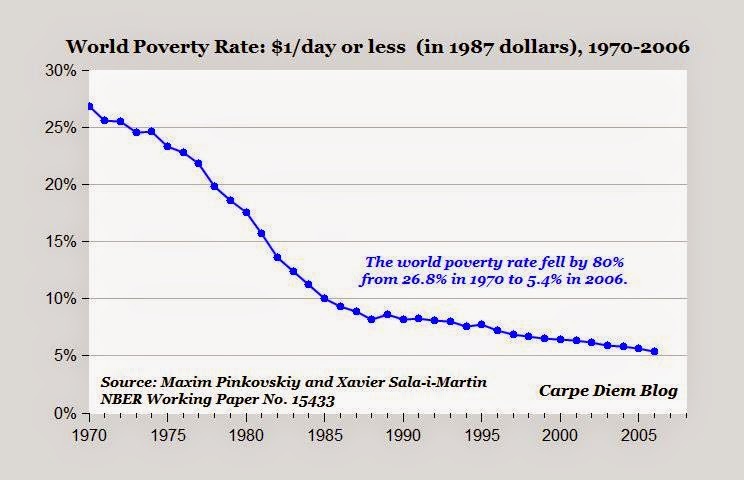 The common factor in economic reform that results in less poverty? Unleashing capitalism. In contrast to the narrative of those hostile to capitalism, the World Bank reports (October 9, 2014) that: "The poorest parts of the world are precisely those that are cut off from the world of markets and commerce, often because of government policies." A Wall Street Journal piece written by Douglas A Irwin (November 2, 2014) titled "The Ultimate Global Antipoverty Program," makes the observation that "world-wide income inequality -- measured across countries and individual people -- is falling, not rising" (emphasis added). There is hope for wealth creation, and great potential for that increased wealth to benefit those who need it most, whether they are bootstrapping themselves out of "third world" status or creating, funding and running a humanitarian organization to do what government can barely manage to do. Clearly, governments that seek self-preservation through increased control and expansion of services stand in the way of both freedom and capitalism -- shackling an entrepreneur in either the public or private sector ought to be a crime. Currently-trendy scare tactics of income inequality requiring some form of government intervention to level the paying field only work on the uninformed. Instead, we ought to be celebrating the effect that economic freedom has had worldwide and supporting those willing to create wealth, whether for commercial or humanitarian purposes. For more about how capitalism could help the humanitarian sector, please visit the Charity Defense Council.